This article is about Polish–Soviet peace treaty of 1921. For Latvian–Soviet treaty of 1920, see Latvian–Soviet Peace Treaty. 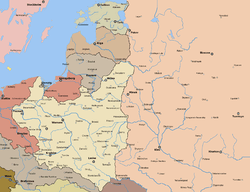 The Peace of Riga, also known as the Treaty of Riga; Polish: Traktat Ryski was signed in Riga on 18 March 1921, between Poland, Soviet Russia (acting also on behalf of Soviet Belarus) and Soviet Ukraine. The treaty ended the Polish–Soviet War. The Soviet-Polish borders established by the treaty remained in force until the Second World War. They were later redrawn during the Yalta Conference and Potsdam Conference. For more details on this topic, see Polish-Soviet War. The Russian Civil War presented an opportunity for Poland under the leadership of Józef Piłsudski to regain parts of the tsarist territories of the former Polish-Lithuanian Commonwealth which had been incorporated into the Russian Empire during the Partitions of Poland. Meanwhile, many in the Soviet leadership desired to respond to Piłsudski's moves into the Ukraine by using military force against Poland, which was seen by the Soviets as a land bridge to Western Europe, and thus to extend the revolution westwards. The Polish-Soviet War ensued, culminating in the Polish victory in the Battle of Warsaw (1920), after which both sides became receptive to ending the conflict. Further military setbacks following their defeat near Warsaw made the Soviets eager to begin peace treaty negotiations, and the Poles, pressured by the League of Nations, were also willing to negotiate after the Polish army had regained control of most of the disputed territories in the war, but was nearing exhaustion. Peace talks began in Minsk on 17 August 1920, but as the Polish counter-offensive drew near, the talks were moved to Riga, and resumed on 21 September. The Soviets proposed two solutions, the first on 21 September and the second on the 28th. The Polish delegation made a counter-offer on 2 October. Three days later the Soviets offered amendments to the Polish offer, which Poland accepted. An armistice was signed on 12 October and went into effect on 18 October 1920. The chief negotiators were Jan Dąbski for Poland and Adolph Joffe for the Russian Soviet Federative Socialist Republic. The Soviet side insisted, successfully, on excluding non-communist Ukrainian representatives from the negotiations. Due to their military setbacks, the Soviet delegation offered Poland substantial territorial concessions in the contested border areas. However, to many observers, it looked like the Polish side was conducting the Riga talks as if Poland had lost the war. The Polish delegation was dominated by members of the National Democrat movement, who were Piłsudski's political opponents. The National Democrats did not want non-Polish minorities in the reborn Polish state to constitute more than one third of the overall population, and were therefore prepared to accept a Polish-Soviet border which was substantially to the west of what was being offered by the Soviet side, even though this would leave hundreds of thousands of people who were ethnically Polish on the Soviet side of the border. This decision was also motivated by political objectives. The National Democrats' base of public support was among Poles in central and western Poland. In the east of the country and in the disputed borderlands, support for the National Democrats was greatly outweighed by support for Piłsudski (and in the countryside outside of the cities, Poles were outnumbered by Ukrainians or Belarusians in these areas). So a border too far to the east was not just against the National Democrats' ideological objective of minimising the minority population of Poland, but would also be an electoral disadvantage to them. War-weary public opinion in Poland also favoured an end to the negotiations and both sides remained under pressure from the League of Nations to reach a deal. A special parliamentary delegation consisting of six members of the Polish Sejm held a vote on whether to accept the Soviets' far-reaching concessions, which would leave Minsk on the Polish side of the border. Pressured by the National Democrat ideologue, Stanisław Grabski, the 100 km of extra territory was rejected, a victory for the nationalist doctrine and a stark defeat for Piłsudski's federalism. Regardless, the peace negotiations dragged on for months due to Soviet reluctance to sign. However, the matter became more urgent for the Soviet leadership as it had to deal with increased internal unrest towards the end of 1920, which led to the Tambov Rebellion and later the Kronstadt rebellion against the Soviet authorities. As a result of this situation, Lenin ordered the Soviet plenipotentiaries to finalise the peace treaty with Poland. The Peace of Riga was signed on 18 March 1921, partitioning the disputed territories in Belarus and Ukraine between Poland and the RSFSR, and ending the conflict. The Treaty consisted of 26 articles. Poland was to receive monetary compensation (30 million rubles in gold) for its economic input into the Russian Empire during the Partitions of Poland. 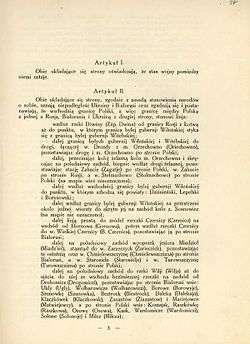 Under Article 14 Poland was also to receive railway materials (locomotives, rolling stock, etc.) with a value of 29 million gold roubles. Russia was to surrender works of art and other Polish national treasures acquired from Polish territories after 1772 (such as the Jagiellonian tapestries and the Załuski Library). Both sides renounced claims to war compensation. Article 3 stipulated that border issues between Poland and Lithuania would be settled by those states. Article 6 created citizenship options for persons on either side of the new border. Article 7 consisted of a mutual guarantee that all nationalities would be permitted "free intellectual development, the use of their national language, and the exercise of their religion." The Allied Powers were initially reluctant to recognise the treaty, which had been concluded without their participation. Their postwar conferences had supported the Curzon Line as the Polish-Russian border, and Poland's territorial gains in the treaty lay about 250 km east of that line. French support led to its recognition in March 1923 by France, Great Britain, Italy and Japan, followed by the US in April. In Poland, the Peace of Riga was met with criticism from the very beginning. Some characterised the treaty as short-sighted and argued that much of what Poland had gained during the Polish-Soviet war was lost during the peace negotiations. Józef Piłsudski had participated in the Riga negotiations only as an observer, and called the resulting treaty "an act of cowardice". Piłsudski felt the agreement was a shameless and short-sighted political calculation, with Poland abandoning its Ukrainian allies. On 15 May 1921 he apologised to Ukrainian soldiers during his visit to the internment camp at Kalisz. The treaty substantially contributed to the failure of Piłsudski's plan to create a Polish-led Intermarium federation of Eastern European countries, as portions of the territory proposed for the federation were ceded to the Soviets. Lenin also considered the treaty unsatisfactory, as it forced him to put aside his plans for exporting the Soviet revolution to the West. The Belarusian and Ukrainian independence movements saw the treaty as a setback. Four million Ukrainians and over one million Belarusians lived within areas ceded to Poland; in one estimate, only 15% of the population was ethnically Polish. The Ukrainian People's Republic led by Symon Petliura had been allied with Poland under the Treaty of Warsaw, which was abrogated by the Peace of Riga. The new treaty violated Poland's military alliance with the UPR, which had explicitly prohibited a separate peace. In doing so, it worsened relations between Poland and those Ukrainians who had supported Petliura. These supporters felt Ukraine had been betrayed by its Polish ally, a feeling that would be exploited by Ukrainian nationalists and contribute to the growing tensions and eventual anti-Polish violence which erupted in the 1930s and 1940s. By the end of 1921, the majority of Poland-allied Ukrainian, Belarusian and White Russian forces had either been annihilated by Soviet forces or crossed the border into Poland and laid down their arms. 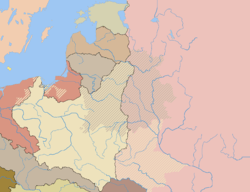 According to Belarusian historian Andrew Savchenko, Poland's new eastern border was "military indefensible and economically unviable", and a source of growing ethnic tensions, as the resulting minorities in Poland were too large to be ignored or assimilated, and too small to win desired autonomy. While the Peace of Riga led to a two-decade stabilisation of Soviet-Polish relations, conflict was renewed with the Soviet invasion of Poland during World War II. The treaty was subsequently overridden after a decision by war's Allied powers to change Poland's borders once again and transfer the populations. In the view of some foreign observers, the treaty's incorporation of significant minority populations into Poland led to seemingly insurmountable challenges, because the newly formed organizations such as OUN engaged in terror and sabotage actions across ethnically mixed areas to inflame conflict in the region. Nevertheless, many groups representing national minorities welcomed Piłsudski's return to power in 1926 providing opportunities to play a role in the Polish government. The populations separated from Poland by the new Polish-Soviet border experienced different fate from their fellow citizens. Ethnic Poles left within Soviet borders were subjected to discrimination and property confiscation. Most of them (at least 111,000) were summarily killed in the NKVD operation in 1937-38, genocide preceding ones perpetrated during WW2, or exiled to different regions of the Soviet Union. Belarusians and Ukrainians, having failed to create their own states, were subjects of extermination in the Soviet Union, e.g. during Holodomor and Great Purge (of which Poles were also victims). Belarusians and Ukrainians living on the Polish side of the border were subjected to Polonization; which contributed to the rise of Ukrainian nationalist organisations and the adoption of terrorist tactics by Ukrainian extremists. The Soviet Union, thwarted in 1921, would see its sphere of influence expand as a result of World War II. After establishing its control over the People's Republic of Poland, the Polish-Soviet border was moved westwards in 1945 to roughly coincide with the Curzon Line. This shift was accompanied by large population transfers which led to the expulsion of the Poles living east of the new border, and also moved most of the Ukrainian minority remaining in Poland to the former German territories that were ceded to Poland in compensation. The unified Belarusian and Ukrainian territories were fully incorporated into the USSR. However, in 1989, Poland would regain its full sovereignty, and soon afterwards, with the fall of the Soviet Union, Belarus and Ukraine would go on to become independent nations. ↑ K. Marek. Identity and Continuity of States in Public International Law. Librairie Droz 1968. pp. 419-420. 1 2 3 4 THE REBIRTH OF POLAND. University of Kansas, lecture notes by professor Anna M. Cienciala, 2004. Last accessed on 2 June 2006. 1 2 3 4 5 6 Piotr Stefan Wandycz (1 January 1962). France and Her Eastern Allies, 1919-1925: French-Czechoslovak-Polish Relations from the Paris Peace Conference to Locarno. U of Minnesota Press. pp. 178–180. ISBN 978-0-8166-5886-2. ↑ Soviet foreign policy: 1917-1980, in two volumes, Volume 1. Progress Publishers. p. 181. 1 2 3 4 Andrew Savchenko (2009). Belarus: A Perpetual Borderland. BRILL. pp. 98–100. ISBN 90-04-17448-6. 1 2 Timothy Snyder (2004). The reconstruction of nations: Poland, Ukraine, Lithuania, Belarus, 1569-1999. Yale University Press. pp. 68–. ISBN 978-0-300-10586-5. Retrieved 16 February 2011. 1 2 3 4 5 6 7 Michael Palij (1995). The Ukrainian-Polish defensive alliance, 1919-1921: an aspect of the Ukrainian revolution. CIUS Press. pp. 165–168. ISBN 978-1-895571-05-9. ↑ J.C. Johari (2000). Soviet Diplomacy 1925-41. Anmol Publications PVT. LTD. p. 42. ISBN 81-7488-491-2. 1 2 Dennis P. Hupchick (1995). Conflict and chaos in Eastern Europe. Palgrave Macmillan. p. 210. ISBN 978-0-312-12116-7. ↑ Michael Graham Fry; Erik Goldstein; Richard Langhorne (2004). Guide to International Relations and Diplomacy. Continuum International Publishing Group. p. 203. ISBN 978-0-8264-7301-1. ↑ Jan Jacek Bruski (August 2002). "Sojusznik Petlura". Wprost (in Polish). 1029 (2002–08–18). ISSN 0209-1747. Retrieved 2006-09-28. ↑ Jerzy Borzęcki (2008). The Soviet-Polish Peace of 1921 and the Creation of Interwar Europe. Yale University Press. p. 232. ISBN 978-0-300-12121-6. ↑ Jan Zaprudnik (1993). Belarus: at a crossroads in history. Westview Press. p. 75. ISBN 978-0-8133-1794-6. ↑ Antony Evelyn Alcock (2000). A history of the protection of regional cultural minorities in Europe: from the Edict of Nantes to the present day. Palgrave Macmillan. p. 73. ISBN 978-0-312-23556-7. ↑ Raymond Leslie Buell (2007). Poland - Key to Europe. READ BOOKS. p. 79. ISBN 978-1-4067-4564-1. ↑ Richard J. Crampton, University of Oxford (1994). Eastern Europe in the Twentieth Century. Routledge. p. 148. ISBN 0415106915 – via Google Books. ↑ Peter D. Stachura (2004). Poland, 1918-1945: An Interpretive and Documentary History of the Second Republic. Psychology Press. p. 65. ISBN 0415343585. ↑ Prof. Marek Jan Chodakiewicz (2011-01-15). "Nieopłakane ludobójstwo (Genocide Not Mourned)". Rzeczpospolita. Retrieved April 28, 2011. ↑ Goldman, Wendy Z. (2011). Inventing the Enemy: Denunciation and Terror in Stalin's Russia. New York: Cambridge University Press. ISBN 978-0-521-19196-8. p. 217. ↑ Snyder, Timothy (January 27, 2011). "Hitler vs. Stalin: Who Was Worse?". The New York Review of Books. p. 1, paragraph #7. Retrieved June 12, 2012. ↑ Jones, Adam (2010). Genocide: A Comprehensive Introduction. Taylor & Francis. p. 194. ISBN 9780415486187. ↑ Jan S. Prybyla (2010). When Angels Wept: The Rebirth and Dismemberment of Poland and Her People in the Early Decades of the Twentieth Century. Wheatmark, Inc. pp. 46–. ISBN 978-1-60494-325-2. Retrieved 16 February 2011. ↑ Aviel Roshwald (2001). Ethnic nationalism and the fall of empires: central Europe, Russia, and the Middle East, 1914-1923. Routledge. pp. 168–. ISBN 978-0-415-17893-8. Retrieved 16 February 2011.